The concept for this project was simple: build the perfect Sunday bike. It had to be lightweight, short travel, sharply focussed on fun and able to dance down singletrack like a roe deer. But first, let me be completely straight. Piecing together a dream build will always be the height of self-indulgence, with an end product that is as unique to its owner as a set of fingerprints. Inevitably the process will take much longer than you’d intended, and involve many hours of procrastination. 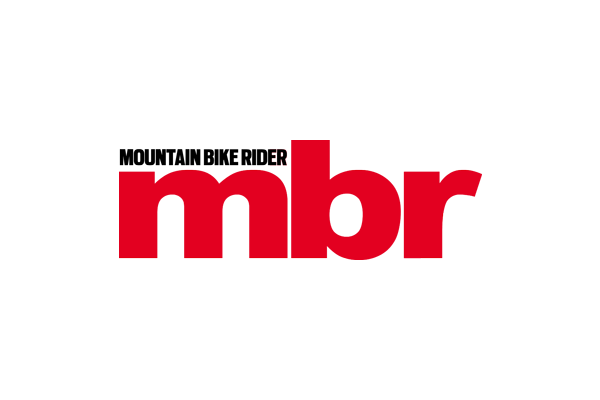 There will be moments of elation – as the final piece of the jigsaw drops through the letterbox – and moments of despair – when you realise that it’s the final piece of a different jigsaw. Days turn into weeks, and progress grinds to a halt waiting for something as trivial as a spacer or an adaptor, but when the final bolt is tightened and life is breathed into the tyres, it’s a moment of great satisfaction. Yet somehow, knowing all this didn’t stop me from embarking on this project. Actually, it’s probably why I did. When what you want – or, more accurately, what you think you want – doesn’t exist in the marketplace, you set about building it. No build can succeed without a clear vision of the end goal. In this case the objective was shaped by the terrain on which it would be ridden. My regular weekly ride consists of a dozen or so minute-long descents followed by equally short, sharp climbs, and that means lots of saddle height adjustment. 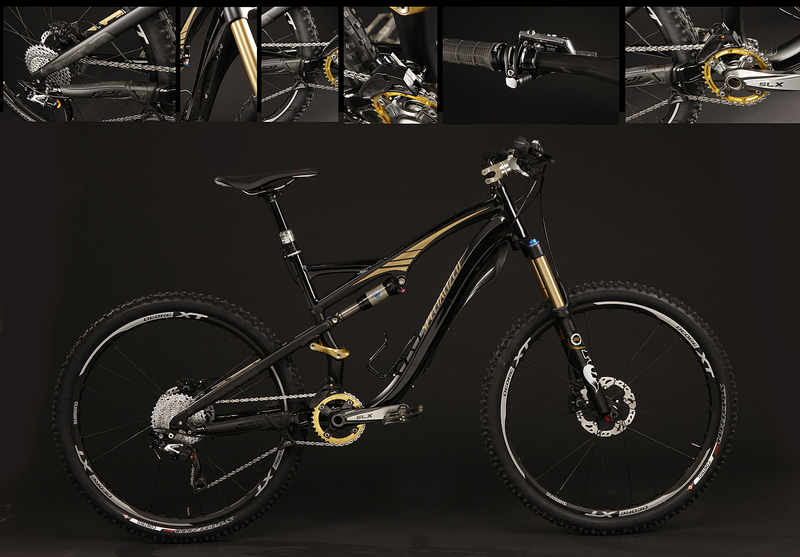 The descents put a big emphasis on handling, but you need very little in the way of suspension. Corners come thick and fast, jinking through both native woodland and forest plantation and there is ample opportunity to get airborne. And the whole area is covered in a wonderful, loamy earth of the type that, being a snobby London media type, reminds me of Lavazza Gold. “Long and low, the Camber is born to corner, and married to a short back end, limited travel and lack of mass means it can be manualled, popped and drifted like few bikes on the planet. 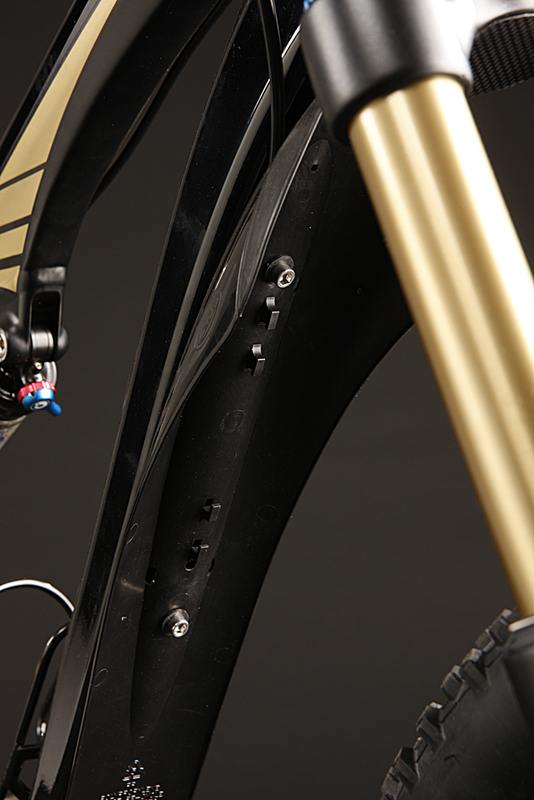 The low standover height is a massive ally, allowing you to move around the bike unimpeded. All the features that make a 4X bike so rewarding, albeit with enough cockpit space to be ridden all day. So I had my prime suspect, but if the Camber had a flaw, it was chassis stiffness. For 2012, however, Specialized has introduced a 142x12mm through-axle and a tapered head tube on the range-topping Camber Expert and in doing so it has answered our main criticism. So with the frame sourced, my attention turned to the components. Although the stock bike matches the front and rear travel at 120mm, I wanted to run a 130mm fork up front. This was for two reasons: Firstly a longer travel fork would increase the potential of the front end and help keep a lid on things when the trail gets a bit rowdy: secondly it would tweak the geometry, reducing the head angle, lengthening the wheelbase and raising the bottom bracket. The stock Camber gets such a low bottom bracket that you’ve got to time your pedal strokes accurately on flatter terrain. I hoped that the longer fork, in combination with another component choice I’ll talk about in a minute, would increase the clearance without compromising the cornering ability. Ever since Fox introduced the Fit-damped 32 fork I’ve been a big fan. 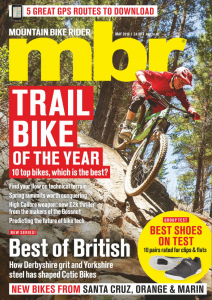 With a nice progressive spring curve that is supple at the top of the travel, but offers plenty of support when braking or riding steeper trails, it suits my riding style perfectly. The damping is controlled and consistent throughout the stroke and it can be configured in any travel you want between 80mm and 150mm. 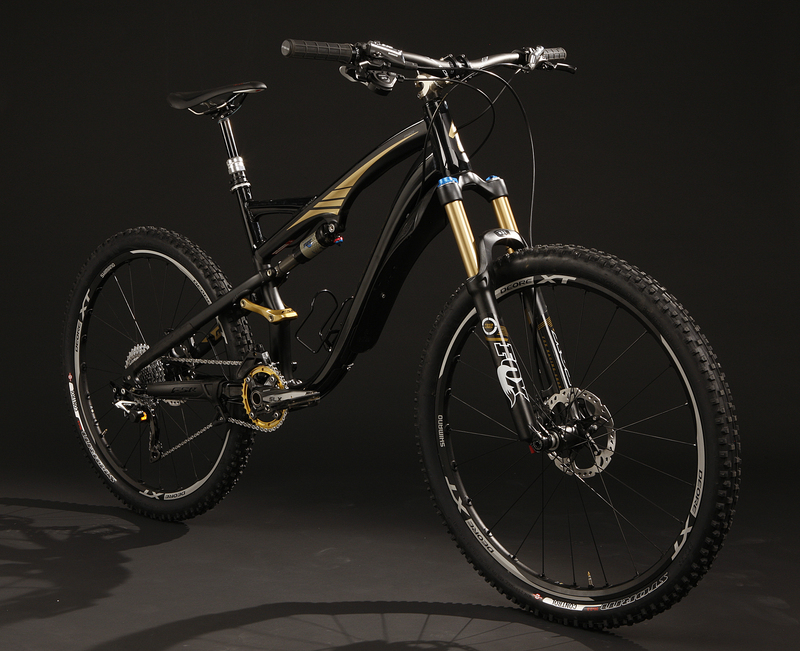 I’d chosen a JPS black and gold colour-scheme for the frame, that not only harked back to the fag packets and Lotus F1 cars of the seventies, but evoked memories of Specialized’s definitive Enduro of 2003. Unfortunately this threw a spanner in the works when it came to the fork. I knew I didn’t need a TALAS fork – my local climbs are so short that there’s just no reason to drop the front end height – but the 32 Float RLC only comes in white and Kashima gold, which just wouldn’t look right. The solution came in the shape of the lesser-known 831 dirt-jump/4X fork. It uses the same chassis and FIT RLC damper as the 32 Float, and although it comes stock with 100mm of travel, this can be increased to 140mm by removing a few internal spacers. I could have chosen a significantly lighter wheelset, but I didn’t want to compromise on stiffness or spend too much time at the truing jig. Shimano’s XT wheels are tubeless compatible, available in two widths and various axle configurations, and most importantly, there was a pair already in the office that would fit the frame. Specialized’s Storm tyre are a firm favourite around the office and work well on our local trails. They begin to run out of steam when it gets really parched, but for Autumn/Winter/Spring conditions the grip is ample and when they do let go, the slide is progressive. I’ve chosen to run them tubeless on the Camber, which might end up being a mistake as the sidewalls don’t give a lot of support, and pressures need to be increased to compensate. Without any arduous climbs to worry about, I knew I could get away with a 1X10 drivetrain on the Camber. A 34t chainring up front with an 11-36T cassette would provide a ratio that was more than ample for anything I would have to haul up. 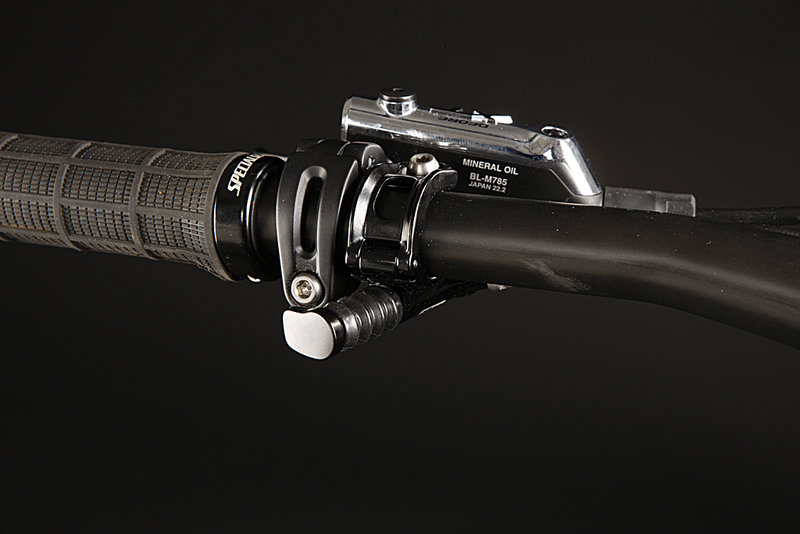 For me, Shimano still has the edge in the shifting department. Its crisp, well-defined cog-swapping is super-light in action and less prone to accidental double shifts than SRAM’s offerings. Unfortunately the Camber frame doesn’t come with ISCG tabs for a chain device, so I was forced into a slightly untidy solution. Specialized had sent one of its Dangler chain tensioners with my frame, modified to fit the Camber chainstay protector, but that still left me needing to find an upper guide for the chainset. In the end E13 came to the rescue with a direct mount XCX that bolts onto the swingarm. 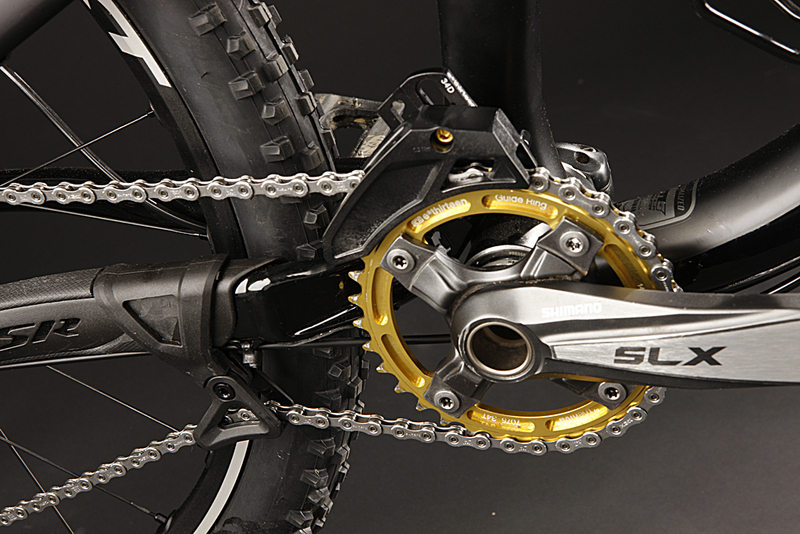 For a belt and braces finishing touch, I elected to fit one of Shimano’s XTR Shadow Plus derailleurs. And to further reduce pedal strikes I decided to run shorter cranks. By using a Press Fit BB30-to-73mm-threaded converter I could run an old set of 170mm SLX cranks with one of Shimano’s durable sealed bottom brackets. Shimano’s new brakes are simply superb. The lever shape is perfect for one-finger braking (as long as you use your index finger), modulation is great and there’s bags of power. Being Shimano, you shouldn’t need to waste time constantly bleeding them either. My only complaint is the Servo Wave brings a bit of initial resistance to the lever, but dropping a squirt of lube on the cam reduces this considerably. We fitted Easton control components to both the 2011 and 2012 Cambers when we tested them, and the 750mm bar/70mm stem combo seemed to suit it really well. So I decided to keep the recipe the same for my Camber. I’ve added a Reverb post, using the right hand remote lever mounted upside down on the left of the bar for a clean cockpit and easy access. By routing the rear brake hose around the right of the head tube and the derailleur housing around the left, then crossing them over under the down tube, I should avoid any cable rub on the frame and fork crown. Just to be sure, I added Madison’s frame protector tape to the sides of the head tube. 3M rubber mastic tape was applied to the driveside seatstay, to protect and dampen chainslap, and beneath the down tube as a shield from flying rocks. So they’re always to hand, I’ve written my pressure settings on the side of the shock and fork with permanent pen, and then covered them in frame protection tape. I’m planning to update this page once the mileage has increased, but the two short rides I have completed on the Camber have been everything I’d hoped for. Although the full build came out a little over my 26lb goal (26.6lb), honestly those few hundred grams were imperceptible on the trail. The bike feels as sprightly as our previous test bikes, despite carrying an extra pound of seatpost around. Ultimately, by ditching the SLX crank and going for a SRAM Press Fit item I know I can save a chunk of weight at some point in the future. Not only is it incredibly chuckable, but the lack of weight makes it easy to accelerate. It’s the kind of machine that lures me into cranking up climbs out of the saddle rather than sitting down and finding a pace. Reducing the mass also lets me run 160mm rotors and still get more than ample stopping power. One of the Camber’s greatest assets is its suspension souplesse. Grip levels are impressive and, coupled with the playful geometry, means confidence is never an issue. In fact the biggest problem is that I can no longer blame the bike for any shortfalls in my riding. Raising the bottom bracket and running shorter cranks has eliminated pedal strikes, and although I did initially notice the slight reduction in leverage, I’m convinced it’s a worthwhile compromise. My only question mark concerns the fork. 831s come with firmer compression damping and a more progressive spring curve, and I’m not convinced that it’s the perfect partnership considering the incredibly supple rear end. A re-valve to the stock 32 Float RLC settings might be on the cards. Still some fine-tuning to be done then, but for a first shakedown, I’m very satisfied with how the bike has turned out. It’s a bike that puts a massive smile on my face every time I ride it, and ultimately, that should always be the driving force.